I picked up Ash for several reasons: I hadn’t read a good YA fantasy in a while, I hadn’t read anything with a lesbian/gay main character in a LONG while (like, Tamora Pierce’s Daja, I think), the Amazon page promised strong female characters, and it’s a retelling of Cinderella, and I’m a sucker for new spins on old tales. This was my first experience with author Malinda Lo, but I can guarantee it won’t be my last. It sounds like a familiar story: Aisling, nicknamed Ash, loses first her mother, then her father, and is forced to live as a servant in the home of her wicked stepmother and stepsisters. There’s a fairy, a prince, a ball, a midnight flight. Fortunately, there’s also a Huntress, Kaisa, who befriends Ash and reminds her what it is like to be cared for after so many years of abuse. The fairy is a man-- a scary, alluring, mysterious man who grants Ash’s wishes but demands a price in return. The prince is a distant background figure, an object of desire for Ash’s stepsisters, but of no interest to her. And the stepmother-- well, yes, she’s as wicked as it gets. In the end, Ash learns the meaning of true love and the sacrifices it so often requires. I also loved the vivid and realistic personalities of the other characters, particularly the dark magnetism of the fairy Sidhean and the gentle, open sweetness of Kaisa. When asked why she is spending time with Ash, a mere servant, Kaisa answers: “I suppose it seemed as though you were being placed in my path time and time again. I wanted to find out why.“ All the characters were carefully crafted, flawed but sympathetic, and interesting to read about. The stepmother was pretty unrelentingly evil, but she’s still the kind of person I try to feel sorry for in real life: someone whose cruelty is so absolute that it must come from a place of misery. 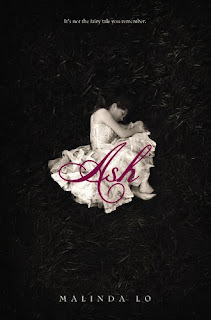 If you like YA, fantasy, fairytales, romance, or (like me) any combination thereof, pick up Ash. As a reader, you’ll be in good hands with Lo, who never lets the tale spin out of control. I highly recommend Ash, and when I read more of Lo’s books, I’ll be sure to tell you about them as well! I've heard a lot about this book. So many people have read it. Glad to see you recommend it. I'll give it a try.